I’ll keep this short, because I have pretty much lost my arm stirring this dish! I am so glad to be back with a bang for Diwali! Moong Daal Halwa (or Seera as we call it in Gujarati) is one of the richest and most laborious desserts you’ll make. Of course I did not realize how hard it was until I had started! I asked my mother for the recipe, and she kept asking me in reply if I was sure I wanted to do this on a weeknight, after I return from work. I am glad, though that I decided to soak the daal and still make this dish! I pushed through a dark, wet evening to prepare, photograph, and of course taste-test a bowl-full before sitting down to type up the recipe. 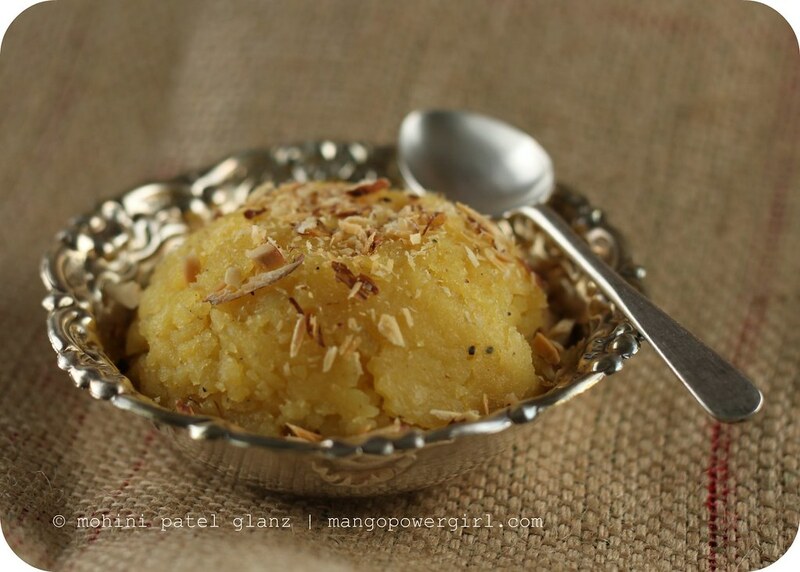 Remember to save Moong Daal Halwa for when you want a rich, traditional Indian dessert, but don’t save the cooking for the last minute. If you are like me and thought carrot halwa was the stirring champion of all desserts, well this beats it, but in the end it is so worth the effort. 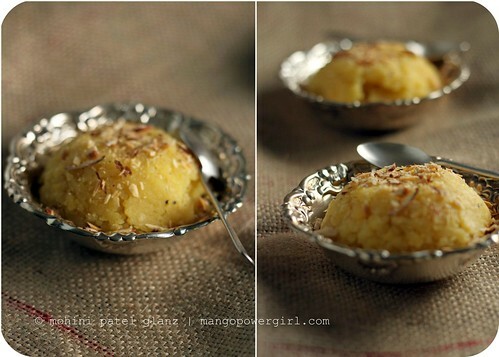 When it comes to Indian desserts, good things come to those who stir! 1. Soak moong daal in water for about 6 hours before you plan to cook, or better: overnight. 2. Drain the daal and grind it into a thick paste in the blender, keeping just enough water to create a thick, rough paste. 3. Melt the ghee on medium heat in a big non-stick pan. 4. Add the daal and stir continuously, until it turns to a faint brown. 5. Add the milk and keep stirring, so that the milk cooks off. 6. Cover for a couple of minutes or so, and then stir again! The goal is to not let the dal stick to the bottom of the pan. If it feels too dry, add more ghee. 7. Dissolve the saffron in some warm water. Pour it in and stir some more. 8. Once that evaporates, add the sugar and cook on low-medium heat till the ghee separates from the halwa. Taste to make sure the daal is cooked thoroughly. If it is not, you have to cook more. If it seems too dry you can add a little more milk while stirring. Also, try covering it for a couple of minutes at a time without letting it burn. 9. Once the halwa is finished, mix in the ground cardamom. 10. Garnish with slivered nuts of your choice and serve hot or cold. I can’t wait to share it with our family & friends to celebrate. There are no fireworks, but we’ve created a warm mini-Diwali with diyas around the house and in this pouring Seattle rain, we’re determined to make the best of it! Happy Diwali MPG! Enjoy the celebrations! The dessert looks delish! wow! i love this post — especially meaningful as I am living IN India now and have just celebrated Divali with everyone — many boxes of sweets included in the wild holiday! your photos are so beautiful in this post, nice job!